This particular Saturday afternoon, as I was leaving some fascinating convention sessions, I spotted a nice scene playing out at the church across the street. It was a lot more interesting than the junk I’d been listening to all day! 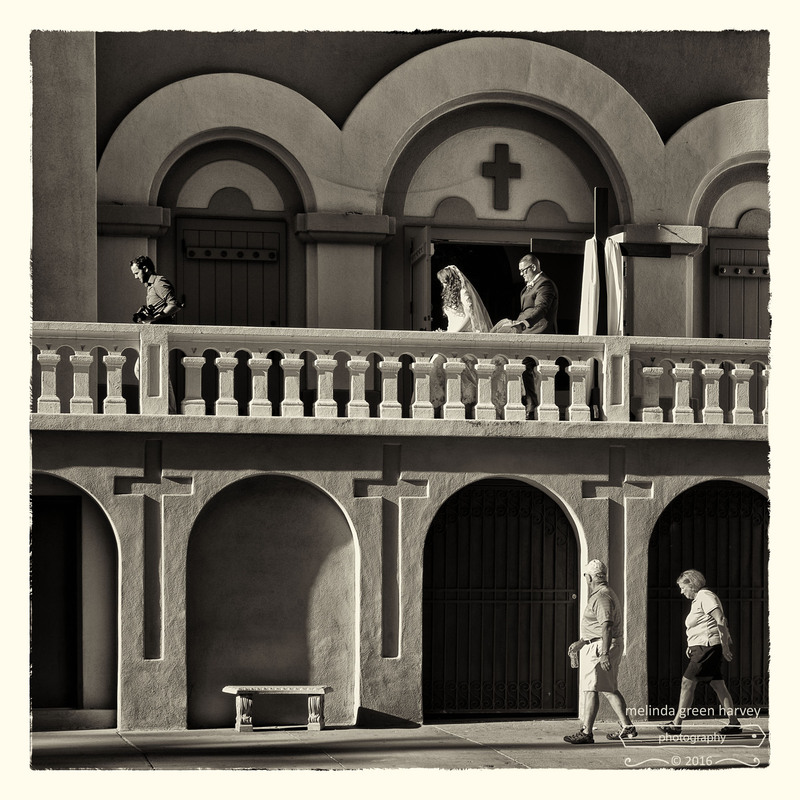 Posted on November 20, 2016, in Photography and tagged 365 photo project, black and white photography, Leica, melinda green harvey, monochrome, one day one image, Phoenix, Phoenix Arizona, photo a day, photography, postaday, St. Mary's Roman Catholic Basilica, street photography. Bookmark the permalink. 21 Comments. I can believe that! Nice image of future hopes. I’ll summarize what I’d heard that day: blah blah blah something planning something something blah planning blah blah. There seem to be two storeys in one story here. What is that curious crescent shape in the upper center arch leading to the cross? It looks like a small crimp in film, and not part of the building. If it is part of the photo then is that arch really a trompe l’oeil? It is a bit disconcerting. I looked back at all the images I shot of the front of the church and that thing is there in all of them. But none of them have a clue about what it might be.It reminds me of gouges I’ve seen worn into metal buildings when bare tree branches scratch against them. Only it’s upside down for that to work, plus the no way a tree could grow up there on that plaza level. Maybe it was a cord or chain or something hanging down that carved the arc into the stucco? At any rate, it was there in April and gone in May when the Google car drove by: http://bit.ly/2gvBA2b. Well, it’s strange because there looks like quite a lot of depth in that arch so how does the arc get inscribed so neatly and uniformly as if on a flat surface. Too bad its gone. If it is on multiple images and in the same place that rules out some strange lens effect, or a post-processing artifact as well. Maybe it was the arc of an alien laser weapon test firing. Wait! I just moved along the street view a bit to the left and zoomed in and I think I can see it very faintly after all. Maybe the excuse for a drive survives! But we might need our reflective tin foil hats to reflect alien laser strikes, just in case you know. It takes *only* five or six hours to drive from LA to Phoenix. Let’s see…if we left after class ends on Sunday, and don’t really need any sleep, we could make it work. Except that it would still be dark when we had to leave. And except that we won’t have a car. And except that I don’t think you can get through US Immigration with a tinfoil hat. But other than that…. No tinfoil hat? I thought they had surged back in fashion down there just a few weeks ago. Perhaps reserved for citizens only, kind of like the right to vote, and to hold a passport. Speaking of passports, I better get mine renewed. No to be too political or anything, but there’s a chance you’re thinking of white hoods…. Yes, those are the ones, they all come with a tin foil lining, right? I’m not sure…maybe I can ask around. We may not want to know. Thanks, Markus! I almost never photograph people, but this was too good to pass up. A fascinating image, only seen by someone with the Ability to See, and missed by the majority. Well spotted, Melinda. Thanks, Andy. It *almost* made that boring conference day worth it! Thanks. There are a lot of stories going on in this little scene, aren’t there? This might be a good image to use with my writing group for a writing exercise – it would be interesting to see how many different directions the writers could take it!